Home > Bicycle Tourism > What is Bicycle Tourism? Readers of this site know that we are involved with advocating for bicycle tourism. But what is “bicycle tourism” really? Bicycle tourism is an emergent way of understanding an array of economic activities involving the bicycle. It is where business, tourism, and advocacy meet. Because it is so multi-disciplinary and takes place in so many forms and doesn’t fit in the traditional discourse of bike advocacy or tourism, there is some difficulty in defining exactly what is bicycle tourism. Some tourism industry definitions we’ve seen classify a tourist as someone who travels more than 50 miles from their home and stays overnight. This, of course, breaks down when you consider the physics and use of a bicycle. For a car, 50 miles is no large distance; but for a bicycle, depending on the cyclist and the terrain, 50 miles could be an entire day’s worth of travel. We’ve done several overnight bike trips that are less than 50 miles from Portland and have stayed overnight, bought food in restaurants in neighboring towns, and would consider the whole endeavor a tourist activity. However, using the traditional and sometimes auto-centric definition of what a tourist is, that trip would not be counted. For us, we would define bicycle tourism as any travel-related activity for the purpose of pleasure which incorporates a bicycle. It is broad, but purposefully so, because bicycle use is so varied. Let’s look at some examples of what we would classify as bicycle tourism. This is perhaps one of the most obvious and visible forms of bicycle tourism, where a large number of cyclists and support crew travel through an area. Great examples of this are Cycle Oregon and RAGBRAI. Participating cyclists and host towns are encouraged to interact. Cyclists support the local economy when they travel through, often setting sales records during the event. 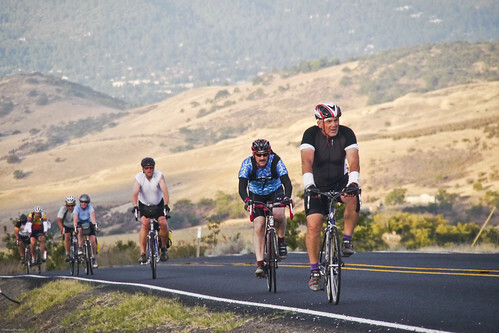 We rode Cycle Oregon in 2012 and spoke to many riders who revisited the towns they passed through at a later date. In addition, Cycle Oregon does an excellent job of supporting the local communities through a grant process. Another very visible form of bicycle tourism is a bicycle event or festival which draws visitors from out of town. Good examples are the Tour of California, which attracts spectators from around the state and country to watch world class athletes perform. 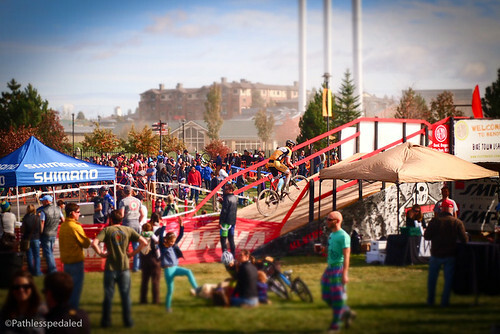 On a smaller scale, we’ve enjoyed going to the Day of the Dead Cyclocross Race in Bend, OR the last few years as just spectators (there is a mandatory costume day). It is not only attended by riders, but also their family and friends, who all require accommodations, food, and copious amounts of beer. Other examples would be the Great Western Bike Rally in Paso Robles, New Belgium’s traveling Tour de’ Fat, and the ever-growing World Naked Bike Ride in Portland. 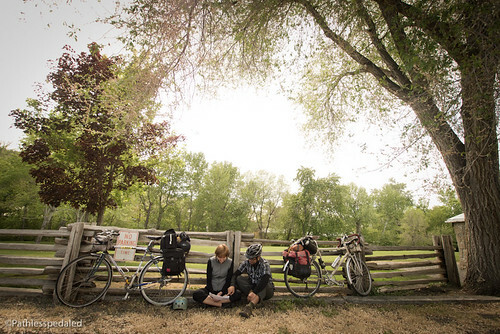 Of course, there is self-supported bicycle touring, which is near and dear to our hearts. This is where cyclists load up their bikes with clothes and camping gear and ride down the Pacific Coast, across the country, and to all points within and beyond. The economic impact of a self-supported tourist is hard to quantify since there are no entry fees or registry. However, there is strong evidence that they make a significant financial impact. We’ve spoken to many businesses along Adventure Cycling routes that cite touring cyclists as an important part of their business. A church in Dayville, OR, which offers accommodations to bike tourists, has been able to add amenities to their community room (like a computer, wifi, kitchen facilities, and laundry) from the donations from cyclists over the years. Self-supported tourists appear “cheap,” but in truth are spending a tidy sum of money; they just have to economize it over a longer period of time. For example, a cyclist riding the Pacific Coast over two months. If their average spending is $20/day, their net spending over the course of 60 days is $1200. Now let’s say there are 2000 people a year who ride the coast (Bike Newport in Newport Oregon has started keeping count and last year they had 1500 cyclists stop in!). If they all spent $1200, that is a total of $2,400,000. Not bad for a bunch of cheap cyclists! Related to long distance self-supported touring are those that go on short-distance bicycle tours because they cannot take off weeks or months at a time. Short-form touring is growing in popularity, because it is the most viable and economical form (in terms of time and money) of bike travel. It is also the most accessible to families. One trend we see is that of older Millennials, who embraced a carfree or carlite lifestyle in their youth, and are now having families. 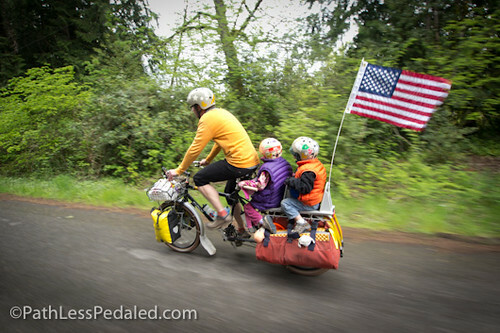 They still want to keep bicycling and are incorporating it into their family vacations. Another form of bicycle tourism is when particular features at a destination attract cyclists to an area. Places like Moab, UT and Whistler, BC for mountain biking, and the Pacific Coast and the Blue Ridge Parkway for road biking, have cultivated a mystique that attracts cyclists annually from around the world. On smaller, but no-less-important scales, are local and regional trails. When we were in San Luis Obispo, we rode the Bob Jones trail, a 4-mile paved path that leads to Avila Beach. It is by no means an epic ride, but even in the middle of January, the parking lot was full of parked cars with bike racks. People were unloading bikes by the car-load to spend a family afternoon riding the trail and enjoying Avila Beach. Hotels in Avila Beach, realizing the popularity of the trail, mention their proximity to it. Another popular example is the beach path in Santa Monica. Residents from around Southern California, and even internationally, come to ride the beach path and spend money at the businesses around the pier. 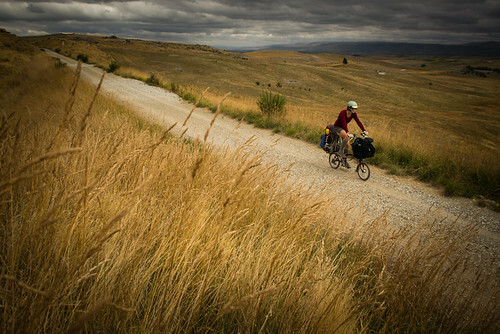 A remarkable example that we’ve thoroughly documented is the Otago Central Rail Trail, a 100-mile gravel path that has completely revitalized an area of New Zealand that was dying on its feet. 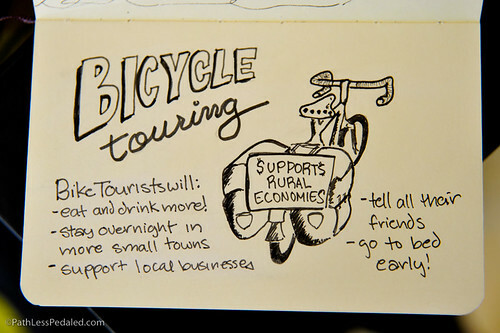 Bicycle tourism is varied and can take shape in many different forms. Everything from the logistical miracles of large event rides to popular biking destinations, all the way to solo self-supported bike tourists. What is remarkable about bicycle tourism is that it can occur virtually anywhere there is a place available to ride a bike. Unlike skiing or surfing, which are dependent on particular geographical features, people ride bikes on mountains, quiet country roads, in cities, on beach paths, and even on snow. It is the sort of tourist activity that almost any region can foster and promote. Our interest in bicycle tourism grew out of our own travels across the country and abroad, where we saw many gems of small towns that most car drivers would pass without even stopping, but which could reach out to cyclists looking for quiet roads. It is our hope that, in the next few years, we can bring the concept of bicycle tourism to the attention of both bike advocates and the tourism industry. But what do you do about friends who shake their heads and look at you funny when you tell them you are going on a bike tour? I have been living the dream of bike touring for quite a while now. My friends mostly encourage me, or pray for me. They love the stories I end up telling. Don’t worry about your non cycling friends. Some will never understand… but in the end, you will be the one with the COOLEST stories to tell your grands. Great essay, pulling all of the aspects of bike tourism together. Wonderful to see how your advocacy is making clear the absolute joy of being out and about in the world, under your own power, connecting minute by minute with real people and a deep sense of place. Your work is defining this in new ways. Bravo! Great story, really captures the various aspects of cycle-touring and cycle-tourism. It’s wonderful to see so many communities, municipalities and non-cycling businesses embrace cycle-tourism and cyclists. Hopefully more will see the immense value in catering to our needs. Well done. Interested to read your article. I do bed and breakfast at http://www.carrhousefarm.co.uk and to celebrate the Tour de France coming to Yorkshire 2014 I have bought 2 cycles so that guests staying with us can have complimentary use of them . Right on. As a Californian who also likes to ride, I find that more people are coming to this state to ride the Pacific Coast Trail or Sierra Cascade one stretch at a time. With more advanced technology like smart phones, solar power, tablets, etc available, I find that getting out for a 3-day ride in the four corners of my state is now possible. The youngest generation is likely to adopt this model for decades to come. Really interesting read/watch – thanks for taking the time to post. I cycled the length of New Zealand about 6 years ago – just a spur of the moment thing – no planning whatsoever! I could conceivably call it the best time I’ve ever had. Now I can’t wait to do a big ride again, hopefully when the kids are a bit older I can attach a trail-a-bike and convince the wife to join me for another circuit. If you mind that I use the picture, please let me know. I met you guys in Iowa in November—appreciated your thoughts. I really enjoyed this article and it was fun to daydream about each different type of bicycle tourism. I also think about places like Montreal, where we’re planning to go as a family, that have great bike infrastructure along with a well-established bikesharing network. I don’t know of any particular trail that is good there, but I do know that’s a fun place to bike around and see the sights.